These are pictures of Barrie’s 200 that he just finished in the fall of 07′. 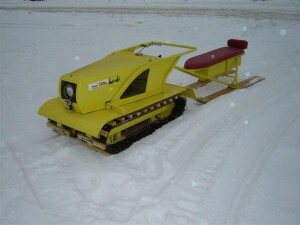 It has the 148 JLO Engine with odd ball “Powerflo Transmission” made by the Morse Chain Company. 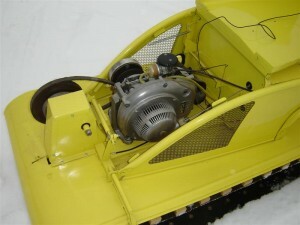 This was offered only on the first 200 models and later changed to the clutch seen on the 200A and the larger version on the 400 and 600 models. 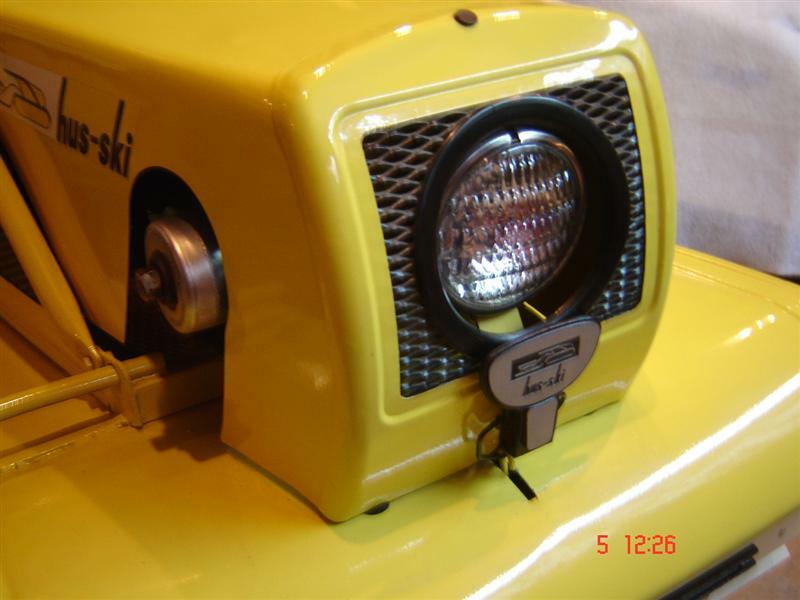 The Hus-Ski model “200” is a term which has been used loosely to describe a snow machine built by Hus-Ski LTD, which was a subsidiary of Johnson Wire Products Limited. The vast majority of the distinct yellow machines with the JLO 148 cc motor are in fact the model “200-A” which was produced after the model “200”. . I was able to acquire an original Hus-Ski bulletin dated “August 10, 1963 Vol 1 No. 1”. The bulletin’s main purpose was to describe the “new and improved features for 1963-64.” These new features were: 1- new engine; 2- variable drive; 3- generator; 4- head light and rear light; 5- wider tracks, fenders and cleats; 6- hinged rear tractor fender; 7-breaks; 8- improved paint job; 9- splined jack shaft These were all new features which were not found on the first model which was powered by the West Bend Power Bee motor. 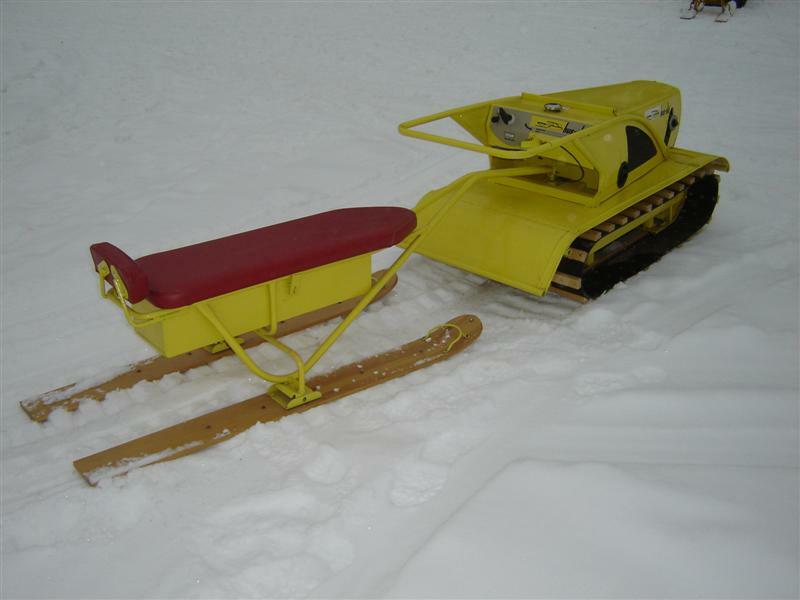 Models 82004 and 82012 were the two West Bend motors which were used in the first Hus-Skis. The variable drive which is mentioned was the “power flow transmission”. This was the first variable speed clutch system installed on the Hus-Ski. 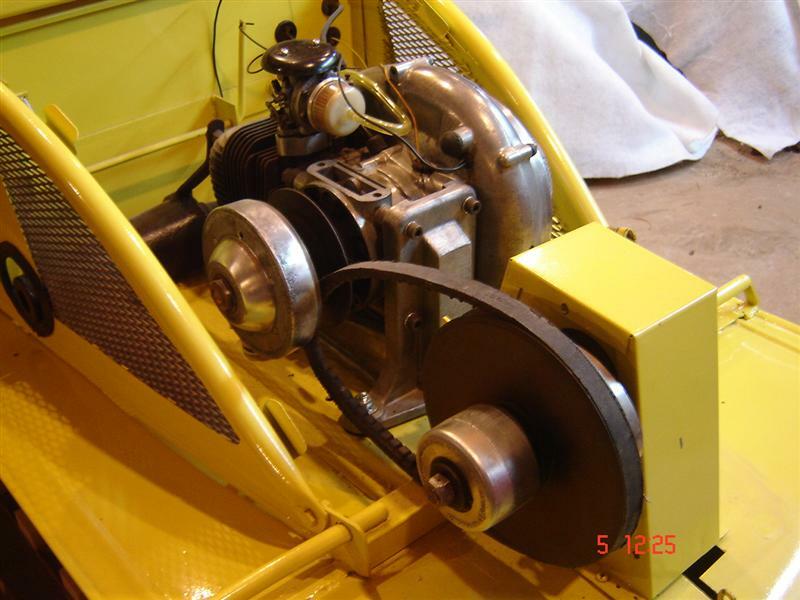 The inner workings of the Powerflo Transmission were five steel balls which would cause the movable sheave to close once centrifugal forces were applied through engine RPMs. The tracks went from ten inches to two twelve inches while the body went from twenty five inches to twenty nine inches. The cleats were changed in dimension from one inch square to ¾” by 1 ½”. The hinged rear fender was also a new innovation but was soon eliminated and replaced by the rubber flap. Early breaks involved the tightening of a band around a break drum. On early models, this drum was a separate piece, closely fitted to the backside of the driven clutch. On later models of the 200-A, the drum was welded to the backside of the driven clutch. The bulletin continued to describe the engines. “The 1963-64 Hus-Ski snow travelers are powered by strong two-stroke JLO engines – either the 8 h.p. on the model “200” or the 9.5 h.p. on the Hus-Ski “400”….” The mention of the model “400” is another significant point as this model is seldom recognized and most often it is not known that it existed. As with many manufacturers during this snowmobile era, changes during production were common. The model “400” had a short life span which lasted no more than one year but features which it had were continued on the model “200-A” , the disastrous model “600” and the common model “444”.